On Tuesday, August 28, the great feast of the Dormition of the Most Holy Theotokos, Metropolitan Hilarion of Eastern America & New York celebrated Divine Liturgy in the Synodal Cathedral of the Sign in New York City. His Eminence was co-served by diocesan vicar Bishop Nicholas of Manhattan, Archpriest Andrei Sommer (cathedral senior priest), Archpriest Edward Chervinsky (cathedral cleric), Hieromonk Lavr (Solomonov; cleric of the Ukrainian Orthodox Church), and Protodeacon Nicolas Mokhoff and Deacon Pavel Roudenko (cathedral clerics). 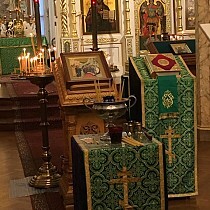 Liturgy took place under the aegis of the wonderworking Kursk Root Icon of the Mother of God, which had recently returned from a visit to the Diocese of Germany. In preparation for the feast, the cathedral sisterhood adorned the shroud of the Mother of God, which several years prior had been gifted to the cathedral by benefactors and seamstresses in St. Petersburg. Singing the divine services was the Synodal Choir under the direction of conductor Peter Fekula. A multitude of the faithful gathered to pray for the feast – which has traditionally been called the "Pascha of the Mother of God" by Orthodox Christians – in order to thank the Most Holy Theotokos and ask for her aid and prayerful intercession before her Son. 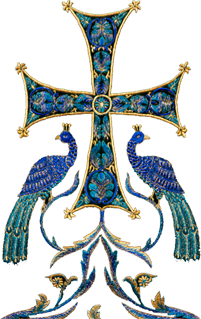 Upon completion of the service, many of the faithful communed of Christ’s Holy Mysteries. Greeting the clergy and faithful with the feast, Metropolitan Hilarion addressed those present with a sermon: "The Mother of God is the only member of the human race who was made worthy to be a divine vessel for the incarnation of the Son of God, Who took on human nature in order to take the sins of the human race upon Himself. The Most Holy Theotokos was chosen for this holy task according to her holiness, thanks to her spiritual feats, being ‘more honorable than the Cherubim and beyond compare more glorious than the Seraphim.’ This is why she can intercede for us before her divine Son. "We know from the Gospel that, when Christ was on the Cross, he entrusted His Mother to the Apostle John. After Christ’s Resurrection, she lived in the Apostle’s home, and during the persecutions spent some time with him in Ephesus, visited Cyprus and saw Lazarus – who after his resurrection after four days became the bishop there – and even traveled to Holy Mount Athos, which afterward became one of the earthly ‘abodes’ or ‘appanages’ of the Mother of God. "When the persecutions ceased, she returned to Jerusalem, where she remained until her repose, which was foretold to her by the Archangel Gabriel. During her life in Jerusalem, the Queen of Heaven spoke about the Son of God and granted an opportunity to come to the Faith to many who had not known the Savior. "Fifteen years had passed since Christ’s ascension into Heaven. The time came, and the Lord could no longer leave His Mother on the earth. When the Theotokos was told of her coming repose, the apostles gathered in order to bid her farewell and bury the Most Pure Virgin Mary. Christ raised up His Mother and took her into Heaven. From that time, she intercedes for us, praying her divine Son that He help us, heal us, and grant us reason. She hears us when we turn to her in need and sorrow, and cares for us." The Metropolitan called on the faithful to turn to the Mother of God with zeal and a pure heart. After the service, a festal luncheon was served in cathedral hall, where interaction between the hierarchs and parishioners continued.